The European Union (EU) and most of its Member States are on track to reach their 2020 targets on renewable energy and energy efficiency. However, recent increases in energy consumption are slowing down progress, according to a new analysis by the European Environment Agency (EEA). The EEA analysis calls for Member States to keep energy consumption in check, particularly in times of economic growth, and to accelerate the decarbonisation of the EU energy system. The EEA's new assessment consists of an annual analysis on the EU's progress towards its targets on renewables and energy efficiency. In this context, the EEA assessment provides input to the European Commission's third report on the State of the Energy Union, also released today. The EEA analysis is supported by updated climate and energy country profiles, which provide detailed information per Member State. The share of renewables in the EU energy mix continues to grow, reaching an estimated 16.9 % share of the EU's gross final energy consumption in 2016, according to preliminary EEA data. 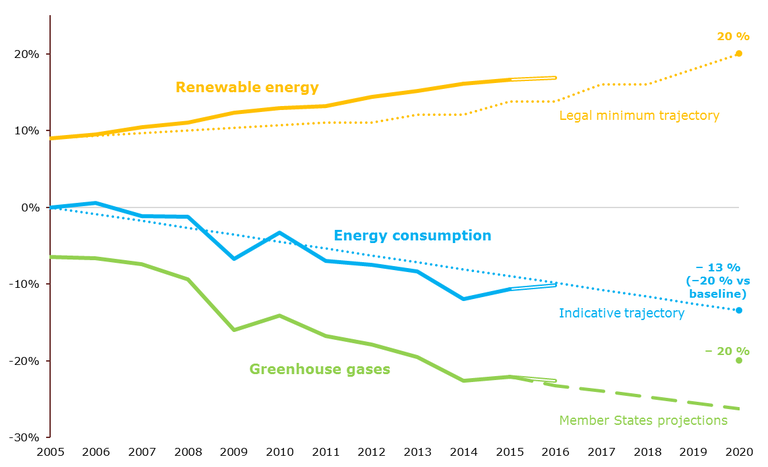 The EU's overall pace of deploying renewables since 2005 would be sufficient for achieving the target of 20 % share of renewable energy consumption by 2020, and for increasing this share to at least 27 % by 2030. However, the growth in renewable energy in 2015 and 2016 was slower than in previous years. In 2015, 23 Member States were on track to meet their individual 2020 targets on primary energy consumption, a measure for energy efficiency. The EEA's preliminary data show that primary energy consumption in the EU increased in 2016 for the second consecutive year, by about 1.2 % compared with 2015. This back-to-back increase followed a large drop in 2014, due to an exceptionally warm winter that resulted in low energy demand for heating. The 2017 edition of the annual European Environment Agency report, 'Trends and projections in Europe – tracking progress towards Europe's climate and energy targets', provides an updated assessment of the progress of the European Union and European countries towards their climate mitigation and energy targets. The report is based mainly on national data on greenhouse gas emissions, renewable energy and energy consumption for 2015, preliminary ('approximated' or 'proxy') data for 2016, and projections reported by EU Member States concerning expected trends in emissions until 2035. For references, please go to https://www.eea.europa.eu/highlights/eu-still-on-track-to or scan the QR code.